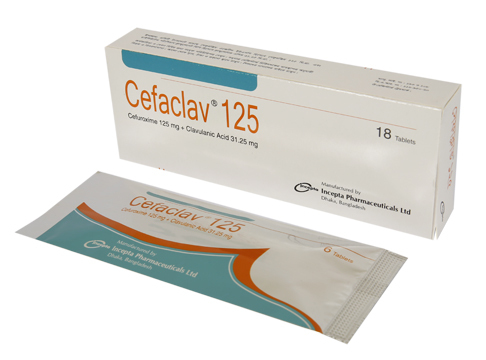 Cefaclav 125: Each film coated tablet contains Cefuroxime 125 mg as Cefuroxime Axetil USP and Clavulanic Acid 31.25 mg as diluted Potassium Clavulanate BP. 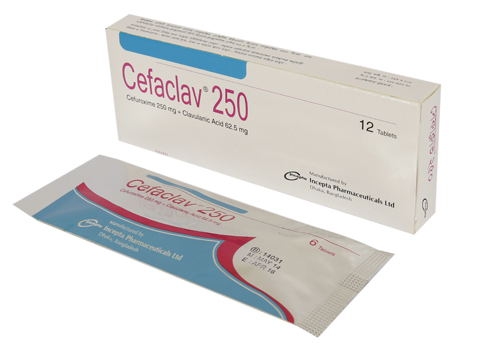 Cefaclav 250: Each film coated tablet contains Cefuroxime 250 mg as Cefuroxime Axetil USP and Clavulanic Acid 62.5 mg as diluted Potassium Clavulanate BP. Cefaclav 500: Each film coated tablet contains Cefuroxime 500 mg as Cefuroxime Axetil USP and Clavulanic Acid 125 mg as diluted Potassium Clavulanate BP. Cefaclav 70 ml powder for suspension: After reconstitution, each 5 ml suspension contains Cefuroxime 125 mg as Cefuroxime Axetil USP and Clavulanic Acid 31.25 mg as diluted Potassium Clavulanate BP. Cefuroxime is one of the bactericidal second generation cephalosporin antibiotics, which is active against a wide range of Gram-positive and Gram-negative susceptible organisms including many beta-lactamase producing strains. It is indicated for the treatment of infections caused by sensitive bacteria. Clavulanic acid has a similar structure to the beta-lactam antibiotics but binds irreversibly to the beta-lactamase enzymes. The presence of clavulanic acid in Cefaclav formulations protects Cefuroxime from degradation by beta-lactamase enzymes and effectively extends the antibacterial spectrum of Cefuroxime to include many bacteria normally resistant to Cefuroxime and other cephalosporins. Skin and Skin-Structure Infections caused by Staphylococcus aureus (penicillinase- and non-penicillinase-producing strains), Streptococcus pyogenes, Escherichia coli, Klebsiella spp. and Enterobacter spp. Septicemia caused by Staphylococcus aureus (penicillinase and non-penicillinase producing strains), Streptococcus pneumoniae, Escherichia coli, Haemophilus influenzae (including ampicillin-resistant strains), and Klebsiella spp. Switch therapy (injectable to oral) after surgery when patient’s condition is improved. Cefaclav may be administered without regard to meals. Shake the bottle well to loosen the powder. Add 35 ml of boiled and cooled water to the dry powder of the bottle. For ease of preparation, add water to the bottle in two proportions. Shake the bottle well after each addition until all the powder is in suspension. Note: The reconstituted suspension must be stored at 2-8 °C temperature and should be used within 7 days after reconstitution. Shake the suspension well before each use. Keep the bottle tightly closed. Generally Cefuroxime and Clavulanic acid are well tolerated. However, a few side effects like nausea, vomiting, diarrhea, abdominal discomfort or pain may occur. As with other broad-spectrum antibiotics, prolonged administration of Cefuroxime and Clavulanic acid combination may result in overgrowth of nonsusceptible microorganisms. Rarely (<0.2%) renal dysfunction, anaphylaxis, angioedema, pruritis, rash and serum sickness like urticaria may appear. Cefaclav should be given with care to patients receiving concurrent treatment with potent diuretics & who have history of colitis. During pregnancy: While all antibiotics should be avoided in the first trimester if possible. 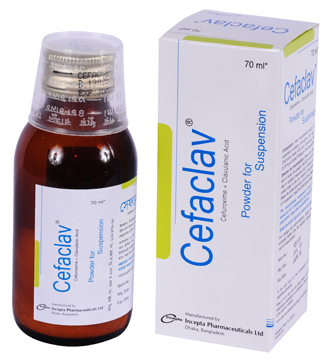 However, Cefaclav can be safely used in later pregnancy to treat urinary and other infections. 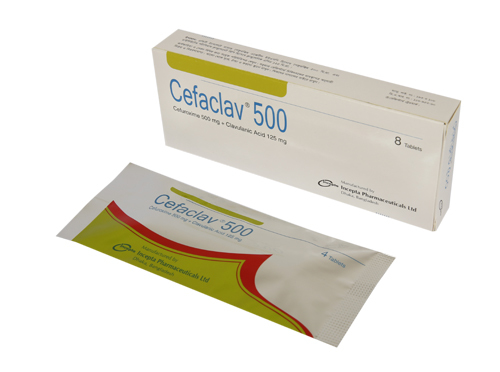 During lactation: Cefaclav is excreted into the breast milk in small quantities. However, the possibility of sensitizing the infant should be kept in mind.